When I wrote The SmallIvy Book of Investing, my goal certainly was not to get rich (and believe me, I’m not). Instead, I wanted to provide a way for individuals and families to learn the secrets to becoming financially independent. You see, there are a lot of people who give information on budgeting and getting out of debt, such as Suze Orman and Dave Ramsey. There are also a lot of books on trading stocks, real estate, and all sorts of other things. There are even some good books on setting up your cashflow to become wealthy (see Rich Dad, Poor Dad). 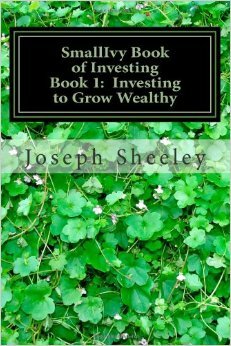 The thing that was missing was a book that tells how to use investing to grow your wealth. The budgeting books have great advise for getting out of debt, but then you’re left treading water. The books on stocks are either the mechanics of buying and selling stocks, war stories from market professionals, or books advocating some strategy. I wanted to create a book that tells what to do next once you’re out of debt. I wanted to tell how to use investing to grow your wealth exponentially. I believe that any middle class person who is willing to make some minor sacrifices can become financially independent within their working lifetime. This book shows how. What I wanted to create was a book that gave the whole plan. This includes things like the basics of different types of investments, budgeting and configuring your cash flow to allow you to invest, and the basics of retirement investing in 401K plans and IRAs. It goes well beyond this, however, giving the specific things you need to be doing at different stages of your life to become financially independent in your forties and then live a very comfortable retirement and be able to leave a legacy for your family. I want to do what I can to end the behaviors that result in people getting to retirement age with nothing to show for it, despite having had millions of dollars pass through their hands during their working careers. I want people to use the money they make to provide protection for themselves and their families so that people aren’t one paycheck away from the welfare rolls anymore. Ideally someone would read the book when they were just starting college and follow the plan so that they would not need to experience the stress that comes from living paycheck to paycheck. So that more people pick up and read the book, I’m dropping the price to $9.99 bewteen now and Christmas on the Create Space e-store. You can purchase a copy here. Copies will also be available on Amazon, although the price drop may not be reflected for a few days. Please consider buying a copy for a recent college graduate or high school senior, or maybe buying a copy for yourself. I truly hope it makes a difference in many people’s lives. Next Would You Treat a Friend That Way?